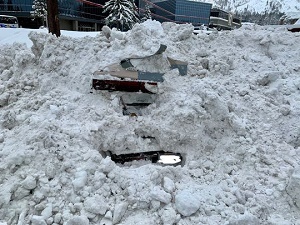 RENO, Nev. – Police in Nevada found a 48-year-old woman inside a vehicle fully buried in snow this month after it was struck by a snowplow clearing the street. The woman was alive and well, according to South Lake Tahoe spokesman Chris Fiore, but her vehicle was completely buried and undetectable to the plow driver. The plow operator and police who responded to help dig the car out on Feb. 17 had no idea there was a person inside until they saw a hand pressed against the window, Fiore said. "With that much snow piled on top of the car ... if the snowplow hadn't hit the back of it we could be having a much different conversation," he said. "She could have suffocated." Police believe the woman was homeless and living in her car, according to Fiore. She told officers she had only been inside the car for a few hours. "Judge for yourself with the amount of snow on top of that car," Fiore said. "It could have been days that she was there." That morning, South Lake Tahoe was digging out in the waning hours of a multiday storm that dumped several feet of snow across the Tahoe Basin.